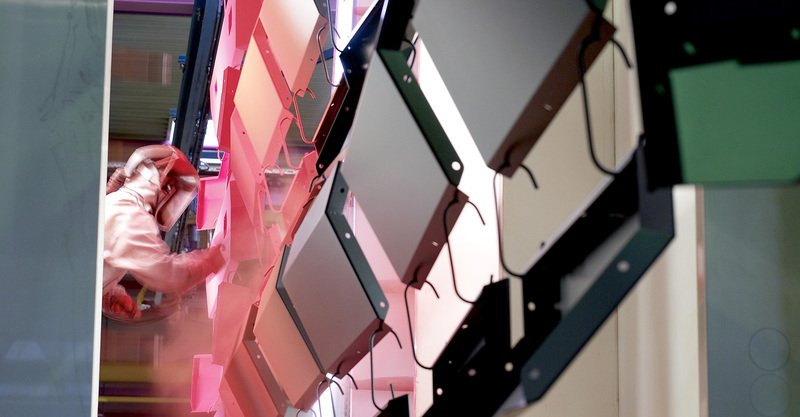 For electrophoretic coating, priming and powder coating, the installations are designed for modules with dimensions (component length / width / height): max. 16,000 mm /2,600 mm / 3,600 mm and a maximum weight of 5,000 kg. Before coating, the steel surfaces undergo meticulous alkaline degreasing, nickel-free zinc phosphating and chrome-free passivation. Depending on the later use, different pre-treatment processes are available for aluminium surfaces, including optional spray-pickling degreasing and chrome-free spray passivation. The black cathodic dip priming (similar to RAL 9005) used, free of heavy metals, is a so-called vario-cathodic electrophoretic material with adjustable layer thicknesses between 10 and 40 µm. It ensures the maximum reliable corrosion protection. Product approvals are available from the automotive, commercial vehicle and agricultural machine industry for this product version. The powder installations fitted with the latest technology for the most part process polyester powder paints, which are available in all RAL colours and in part also in special shades. Our customers receive correspondingly individual and solution-oriented advice. Contact us directly with your ideas for surfaces: +49 5941607-0. Thanks to the great flexibility and quality of the individual procedures, large-scale coating is possible too.